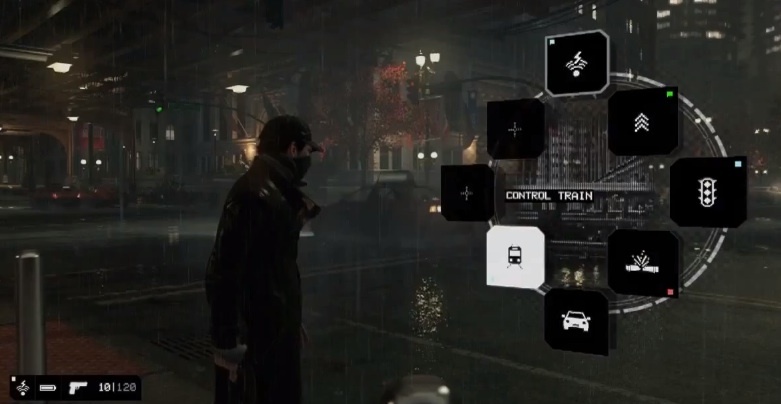 Ubisoft’s crown jewel of their conference comes in the form of a new title called Watch Dogs. From this nine minute video, you see a man in what looks like an open world setting hack the heck out of everyone’s cell phones. It’s all much cooler than that sentence makes it seem, I promise. So many interesting things going on here. From what we can tell, we have a gentleman who has quite a bit of control over all technology, and uses it to find and take down hits. Why he does this, we don’t really know yet, but he does it quite well and it’s very cool. The man first disrupts cell phones outside of a club to sneak inside, then uses his phone to listen in on someone speaking to his target where he learns his target is driving towards the club. Back outside, he makes the street lights malfunction, causing a wreck of several cars including the one his target is in. Before authorities arrive, he puts a bullet in his objective, steals a ride and runs. At the end of the video during the conference, player control actually shifted from this first man to what looked like some sort of detective, giving the hint that you play multiple characters on both sides of the law. This game looks incredibly slick. While the official site lists no release date or platforms, it has been said on various shows that the game will release at least on PC, Xbox 360, and PS3. I don’t know what you meant by “demoed on the xbox during the event”, but Yves said on an interview on SpikeTV that the gameplay in the video was on a high-end pc. He also said the game will be coming to “PC, PS3, Xbox, and…we’ll see”. Thank you. That’s actually a good point. I was going to go back and change that bit and got caught up on other things. During the event, they were using an Xbox controller so in my rush to write this thing I put that in there not remembering how easy it is to use a controller on PCs nowadays.